Thomas's poems continually depict artistic expression as a source of renewal, suggesting that change often begins in the literature of protest. . . . the pieces in this collection present various theoretical ideas through moving personal narratives, poetically 'burning' and 'flowering' all the while. . . . Frequently invoking one's ability to be heard as an expression of agency, the poems suggest that such freedom bears with it a responsibility to those whose voices have been silenced. . . . Thomas often invokes the idea of listening as a metaphor for tolerance. 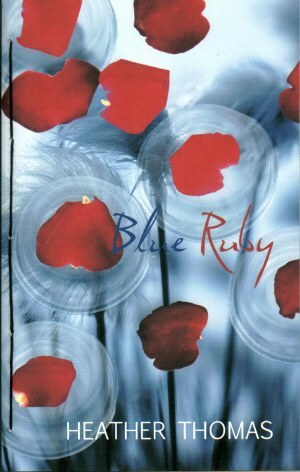 Blue Ruby is an engaging and enigmatic read . . . . highly recommended. Heather Thomas’s Blue Ruby is a beauty, composed by a fearlessly compassionate intelligence: “everything exists because/ something else does.” Primarily, it’s poems in flexible, driving, sensuous two- and three- line stanzas (also a new kind of urgent pantoum). “I write with my eyes.” But Thomas joins a growing band who can’t help but unite the personal and political. She demonstrates that the “pearl-of-great-price” is anyone, anywhere, self or other one.The poems hurt but have a carved, litup surface, red and blue and many other colors. 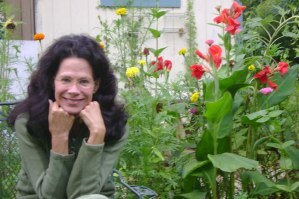 Heather Thomas is the author of Blue Ruby and four other poetry books: Resurrection Papers (Chax Press, 2004; 2011), Practicing Amnesia (Singing Horse Press, 2000), Circus Freex (Pine Press and Standing Stones Press, 1995), and Voiceunders (Texture Press, 1993). Her new book, Vortex Street, is forthcoming from FutureCycle Press in 2018. Heather’s poems won a 2014 prize from the International Literary Awards, Salem College Center for Women Writers, as well as two Gertrude Stein Awards in Innovative American Poetry and an Academy of American Poets Temple University Prize. Recent poems are published in Barrow Street; Women’s Studies Quarterly; Mizna: Prose, Poetry and Art Exploring Arab America; Canadian Woman Studies; Excavating Honesty: An Anthology of Rage and Hope in America; the Wallace Stevens Journal; and Common Wealth: Contemporary Poets on Pennsylvania. Heather’s poems are translated into Arabic, Albanian, Hebrew, Italian, Lithuanian, Spanish, and Swedish. She is an emerita Professor of English and Professional Writing at Kutztown University and currently teaches creative writing at Cedar Crest College. She lives in Reading, Pennsylvania.